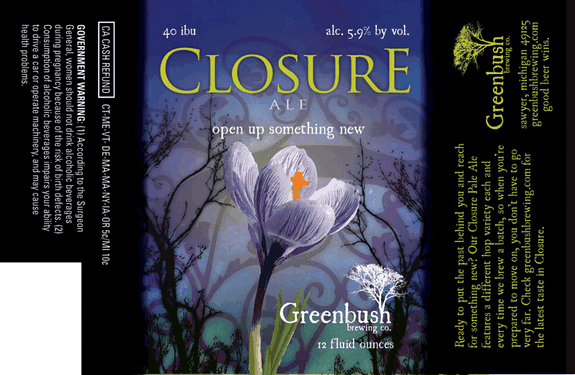 I've had a folder full of labels by Sawyer, MI's Greenbush Brewing Company for a while now. They have a distinctive style and brand done by the Indiana firm Manifesto 1, formed by embracing some of the darker, creepier comments. These labels are artistically strong and build a consistent brand on the back of a style that is almost cathartic. The beer presumably tastes better than barbed wire. 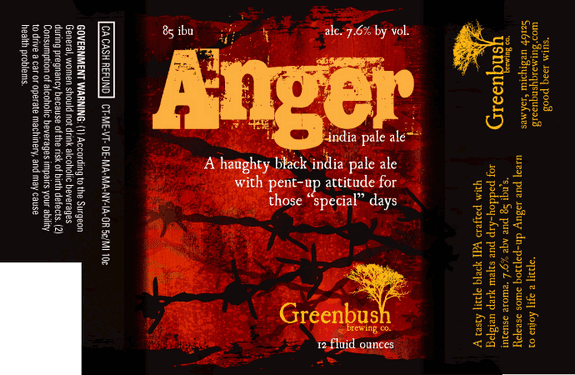 Anytime you're willing to name your beer "anger," you're aiming more at Stone than you are at Victory. Here we have a distressed wodcut stencil for the lettering, which in yellow pops against that red-orange background. Barbed wire criss-crosses it at different levels of fading, making it seem like they are further away in a kind of red mist. The only problem is that some of the white text gets lost in the yellow and lighter orange ink. I particularly like how the dark black bleeds onto the grey of the text panels, which otherwise could seem disconnected. We see similar characteristics in several of these labels. 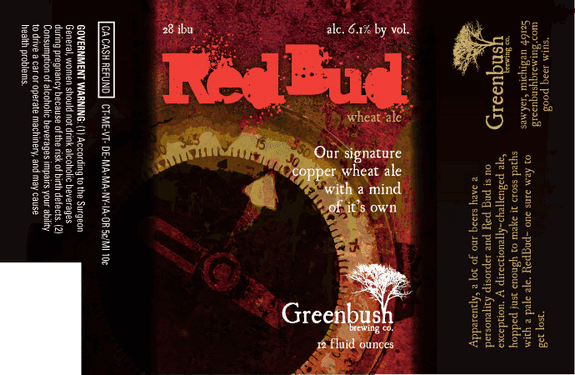 The Red Bud wheat ale uses another distressed lettering, this time like an overfilled letter press with splatter leaking out. The image of the compass is faded and has watermarking over it, like the barbed wire in the Anger. Also, we see again the white type that runs into some readability issues over lighter color fields. Interestingly, the original designs up on the Manifesto1 site all have descriptives for the ounces, rather than the federally mandated "12 fluid ounces." This one said "12 indecipherable ounces." Fact: Faulkner never wrote a story about dunes shaped like umlauts. 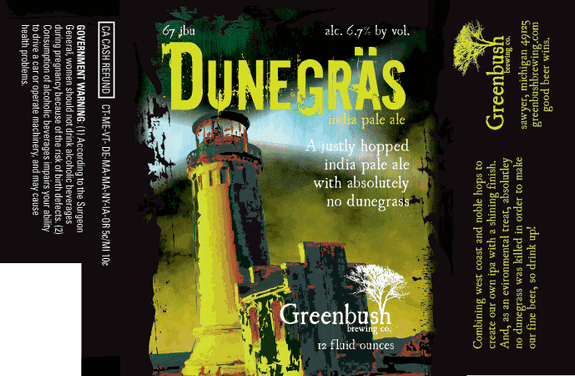 The Dunegras (my umlaut key is broken) IPA uses similar lettering, even to the part where the contrast doesn't work perfectly with white and yellow lettering on light backgrounds (part of the price of keeping that yellow-green a dominant color). Now they incorporate a manipulated photograph. Recoloring and juicing the contrast gives the image a vaguely threatening or distorted feel. 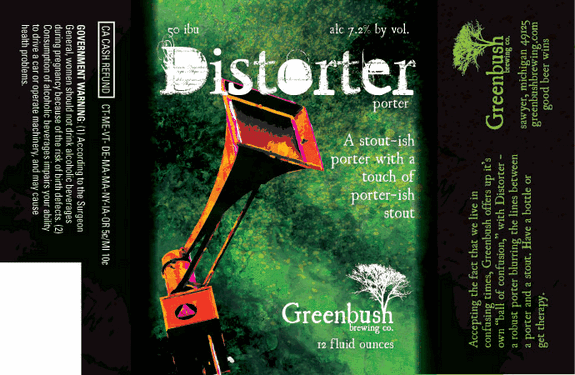 The Distorter Porter (unfortunate rhyme) uses a similar visual manipulation and text effect. The red-green contrast here makes the image a bit clearer than the others. The lettering contrast is better, though white type on the lightest patch of green wasn't maybe the best choice. A little burn in Photoshop would have fixed that pretty easily. 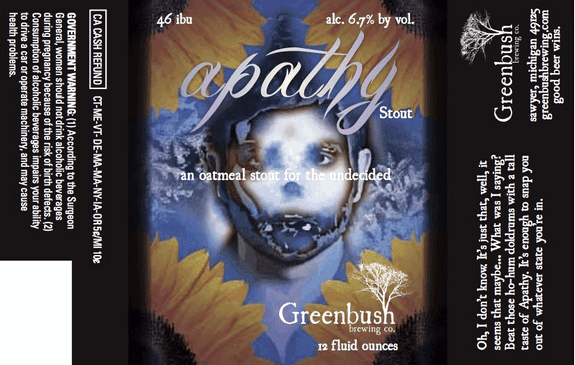 Apathy would be a great name for a horror movie. All right, even I have limits when it comes to creepiness in art. They're tough to get to, but this sure does it. I am going to have nightmares about the kid. The problem with white text on light backgrounds has now gotten to the point where half of their main descriptor is unreadable because it's white on white. Nice flavor text on the right panel to illustrate the point. No, not the Patrick Swayze type of ghost movie. An empty rocking chair that looks like it's out of a ghost flick, paired with a Gothic font. The text on the right panel isn't nearly that creepy. By now, you get the whole light-text-on-light-background theme I'm hitting. I have the sudden urge to play Skyrim. Okay, well that hammer would mess someone up. The anvil and horns are are pretty badass, too, especially on the gray-green background that looks like a cross between smoke and stone. I'd have added a shadow or outline to the Pain name, but it still looks really cool, and the contrast works for the most part. The only thing that looks weird is the lower Greenbush logo on the lightest pat of the anvil. 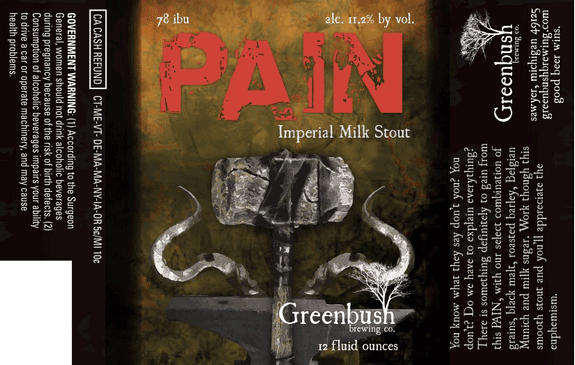 Pain is a cool name for a beer, but am I nuts that I think it's strange for a milk stout? Still, 78 IBU is different for a milk stout, too. Now that is a gorgeous label. The central flower works against all three background elements. The beautiful shades in the blue-teal gradient, the snaking arms of the bare trees, and the watermark of the wrought-iron gate all play on the idea of closure and opening. There's a Good Earth joke to be made here. Rather than a heavily manipulated image, we just have a silhouette over a patchwork earthtone background and a watermark of plants. 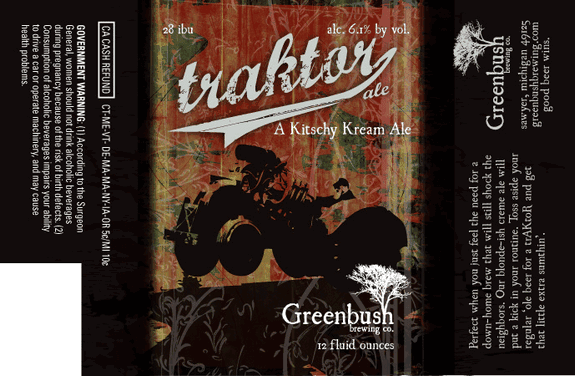 I love that it's called a "Kitschy Kream Ale," though misspelling cream was unnecessary. There was originally a cartoon devil in the top right that they thankfully eliminated for the final. 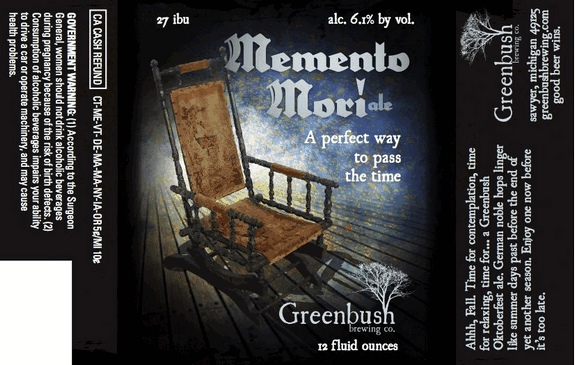 All in all, I think Greenbush and Manifesto1's work is consistent and resonant, if not without flaws in its execution. It's certainly a cool brand that is distinctive within craft beer, an increasingly tall order. Drink Philly's design intern April has created a pretty awesome poster for Philly Beer Week on the beer history of Philadelphia. Beerpulse has two business stories, one on the changing of investment laws to allow small equity stakes for the 99%, and one on the fact that the Sam Adams small business loan program currently has a default rate of less than 4%. Wow that closure is a beaut! Looks like if I had it in real life, it'd be too pretty to open!